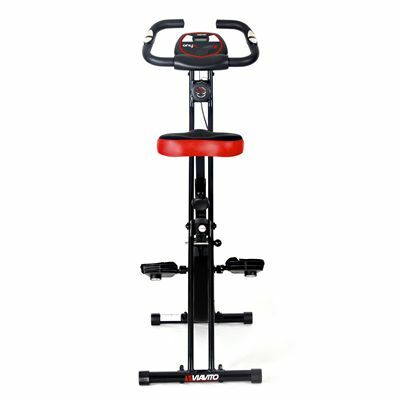 The Viavito Onyx folding exercise bike is a convenient and practical piece of equipment that will help you get in shape and work your lower body. There are 8 levels of manually-controlled magnetic resistance and the cast iron flywheel weighs 1.2kg (2.6lbs) and is friction-free, encouraging smoother motion. This indoor cycle is strong but light and easy to fold up and store after use, making it very space-efficient and an excellent choice for use at home. The single LCD console will display a full range of live session feedback including time, speed, distance, calories, odometer and your pulse when using the hand pulse sensors. The saddle is padded and you can adjust the height to suit you, and the foot straps on the self-presenting pedals are also adjustable. 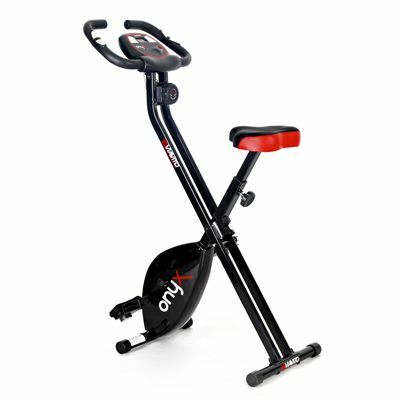 for submitting product information about Viavito Onyx Folding Exercise Bike We aim to answer all questions within 2-3 days. 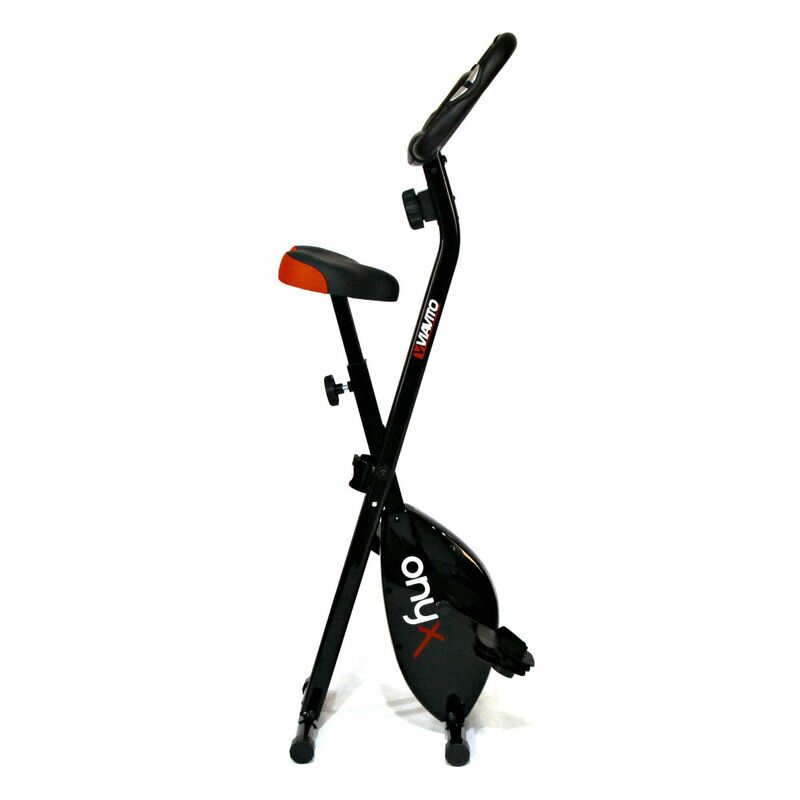 for submitting product information about Viavito Onyx Folding Exercise Bike. We aim to answer all questions within 2-3 days. If you provided your name and email address, we will email you as soon as the answer is published. is this bike quiet during use? The bike offers silent, friction-free magnetic resistance. It's not completely silent but it's not far off and certainly shouldn't disturb anyone else in the household when it's being used. I am 5'8 and when sitting on the seat I want the leg in the lower pedal to be absolutely straight will that be so? Of course it depends on body proportions but the bike is suitable for a person of that height. 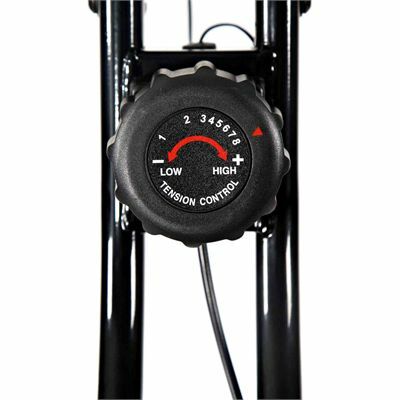 At the highest adjustment of the seat, it is 75cm (29.5") from the pedal at the lowest point. Is this good for decreasing belly fat? 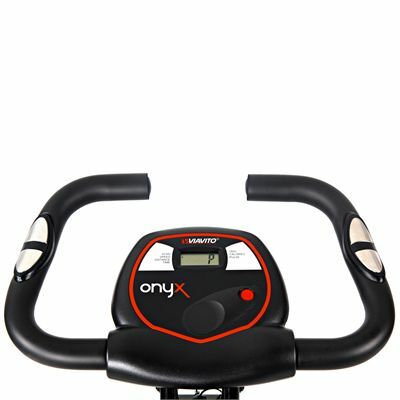 Yes, regular workouts on the Onyx exercise bike will help you tone your legs, thighs and buttocks and allow for strengthening your arms, back and abdominal muscles which enable you to maintain a correct position while exercising and therefore also work. My partner is 6ft 2inches. Is it ok for a person this height? Yes, Viavito Onyx Folding Exercise Bike is perfect for this height. Is this good for building legs muscles? Yes, all cycling is good for building both endurance and strength in the leg muscles. I am four feet nine tall and 6 and half stone. Is it ok for me? 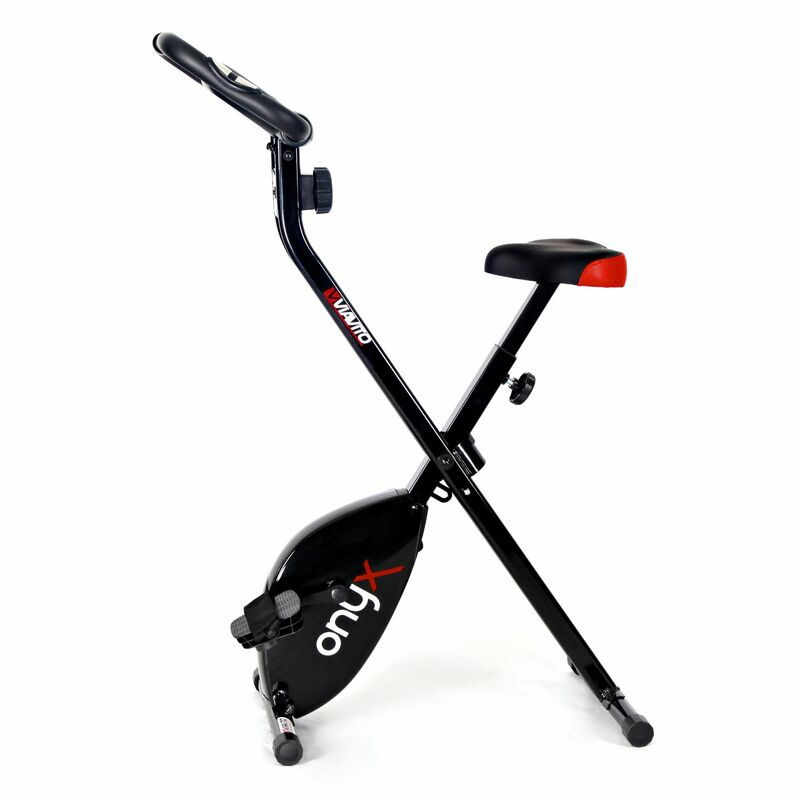 Yes, Viavito Onyx Folding Exercise Bike would be perfect for you. Do I have to do any assembly on this model? 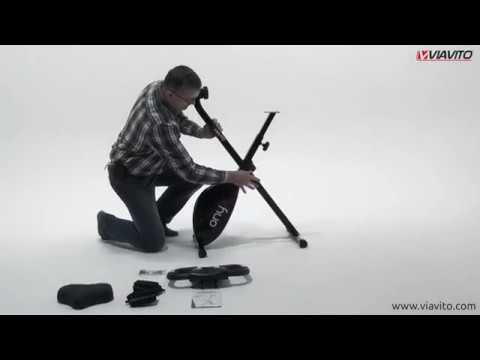 It is not assembled, but you can do it by yourself, the installation is quite easy. All the assembly steps you may find in the User Manual (available under the product description in the pdf file), which is user friendly. Would this be suitable for a person who is 6 foot tall? 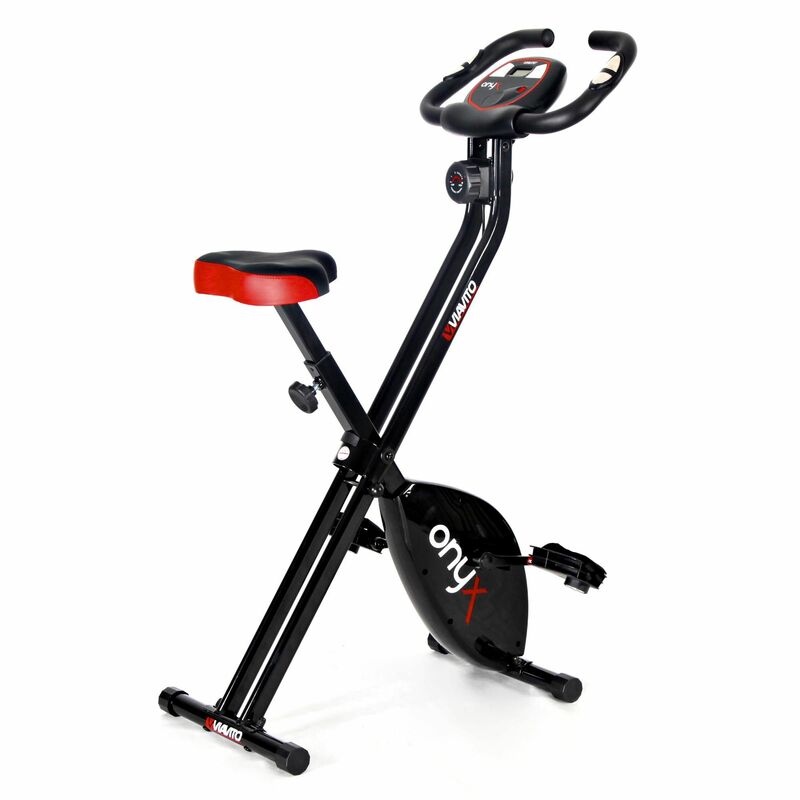 Viavito Onyx Folding Exercise Bike is perfectly suited to someone of that height. What is the maximum distance from pedal to seat? At the highest adjustment of the seat it is 90cm from the floor. It is also 75cm from the pedal at the lowest point and 52cm from the pedal at the highest point. What is the weight limit of person that can use this? The maximum user weight for this product is 100kg. My wife is only 5 feet tall- would this bike be adjustable for her to reach the pedals easily? The saddle is adjustable so she would be able to use this bike. The bike can be set at zero resistance. Very affordable price and compact to store which is essential for me. Adjustment of controls adequate. My second purchase, one now at my elderly mother's to allow me continual exercise opportunity. Recommended for my ostio arthritis. A very good basic e er use bike. Computer functions more than adequate, very quiet. Easy to fold and store. I, a lady of 76, found the exercise bike very easy to build from the instructions, very robust and easy to use and understand the readings. The safety bar is a valuable asset. I have only had this bike for a few weeks but so far things seem to be working well. I hope it continues to give me long and lasting use. Happy with quality of the bike for the price paid. Happy with the way this bike folds up when not in use. NOT happy that the seat even on the lowest setting is still too high for me. I am a female 5' 4" and have never felt that I had short legs. Have ordered a step stool to enable getting on and off safely. I am very pleased with this purchase, it is great value for money. The seat is very comfortable, well padded, the bike is sturdy and folds neatly when not in use. For a novice like me the resistance levels are just right, nothing too strenuous. I bought this to help ease my arthritis and it does that well. the display has all the info I need, it may lack the detail of more expensive bikes but its ideal for me. I do not go to gym and was not so keen to have a bike either. But my husband was worried about me that I started to put on weight/bingy eating due to stress!! So I finally agreed to buy and searched for reliable products and I thought I can trust this one. I am now so glad that I bought ONYX, very stable/strong, quiet and easy to put away. I Exercise while watching TV, listening to music, radio and I start singing and felt much better after got off the bike. The Owner's Manual was really detailed and I followed the Beginner's Guide to Exercise /Workout Tips/Tips for Stretching etc. Now just over a month passed, I have gradually built up stamina and enjoying much longer time. (20min/3-4 times a day) Whenever I feel stress out, Not go to the kitchen, Get on the Bike and start paddlling and sing aloud!!! (like hamster!) I lost a few pound already but, more than anything, I am much appreciated it that ONYX helped my Well-being, I feel much better and positive. My friends noticed the change in me!! The ONYX is not just a bike, it my Stress Buster Buddy!!! I have recommended to a few friends already!! We can encourage each other to move forward, even a little bit, from every difficult issue we may have. Very good, very reliable and much affordable price. Exercise and Laughter are the best Medicine!!! Hightly recommended. Not impressed by the product but really impressed by the business and customer service from sweatband. They have been proactive and excellent. Easy to assemble with good solid screws, nicely padded seat, very sturdy compared to many home exercise bikes. Folds up nicely when not in use, and is sturdy enough not to move across the floor in use. I have only used it several times so far and in short bursts, but the display is clear and easy to understand. Nothing flimsy or cheap looking about it, great value for money. So far, so good. 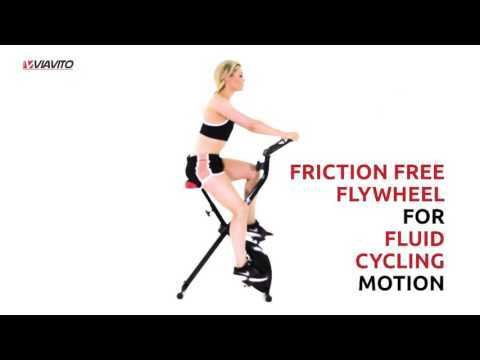 for submitting product review about Viavito Onyx Folding Exercise Bike.